Endurance Films, an industry leader in multisport video production, today announced the release of RIDES: TEXAS, the sixth volume of the hit indoor cycling training series. RIDES places the stationary cyclist in to a virtual pack for training sessions through some of the country's most popular and challenging cycling areas. RIDES: TEXAS stampedes into Johnson County, just south of Dallas, an area tremendously popular with regional cyclists for its rolling terrain, flexibility to individual training goals and beautiful backdrop of vast prairies and sprawling ranch lands. The RIDES series, one of the first virtual products to market, is unique in its simplicity, low cost and high value. "The goal has always been to stay away from high-cost computer interfaces and monitoring equipment," says Endurance Films' owner Eric Feller, "At their core, every RIDES workout is based on a riders' Rate of Perceived Effort (RPE), which is unique to each rider and allows anyone to perform and enjoy the workout, regardless of age or ability which makes it an extremely hot item." The RPE is part of a dynamic on-screen display that includes goal heart-rate zone and tempo, and is enhanced by optional coaching voice-over, regional facts and a compelling original score. Joe Friel, author of the best-selling Triathlete's Training Bible, considers RIDES a valuable training tool and comments. For several years I've worked closely with Endurance Films. The quality of their products is unrivaled and the information presented in them is cutting edge." "RIDES: TEXAS is just the sixth of many to come in production of the series," says Endurance Films' VP of Development, Danny Kolker, "We constantly get e-mails from RIDES fans complimenting us on the product and asking when and where the next one will be!" Endurance Films is currently in pre-production for at least the next two RIDES volumes and is anticipating a European shoot in the near future. 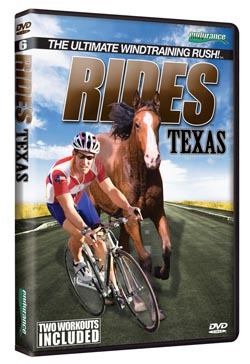 DISTRIBUTION INFORMATION: The RIDES series is available internationally, online and at select retailers. Please contact Endurance Films for wholesale information.